After what feels like the most extended summer season I’ve seen in years, autumn is here in full rainy force. To cheer us all up during this time I thought I’d take a moment to reflect on the past couple of weeks and highlight some of the flowers still in bloom in the gardens. The picture above is a recent capture of our Herb Garden. It certainly has embraced all of the fall colors and we have been enjoying its long-lasting beauty. Mexican bush sage is one of the first plants that really blew me away when I began working at Blithewold. Its fuzzy gray stalks and even fuzzier bright purple flowers are a highlight of the garden in October. Not to mention that the butterflies and bees love this plant (along with the other late blooming sages). It is the type of flower I cannot resist reaching out to touch. That tactile experience with our natural world is important these days when so many of us are tied to desks or phones. 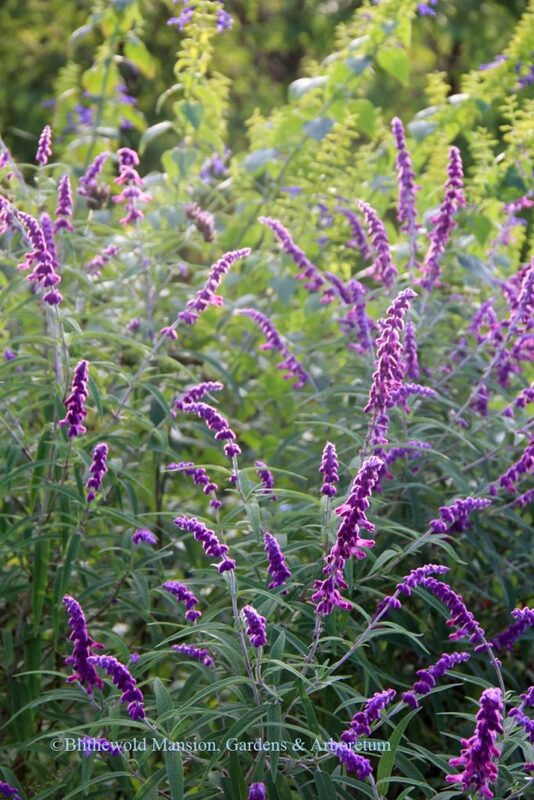 We need a chance to reconnect with nature and Salvia leucantha is a perfect way to do that. 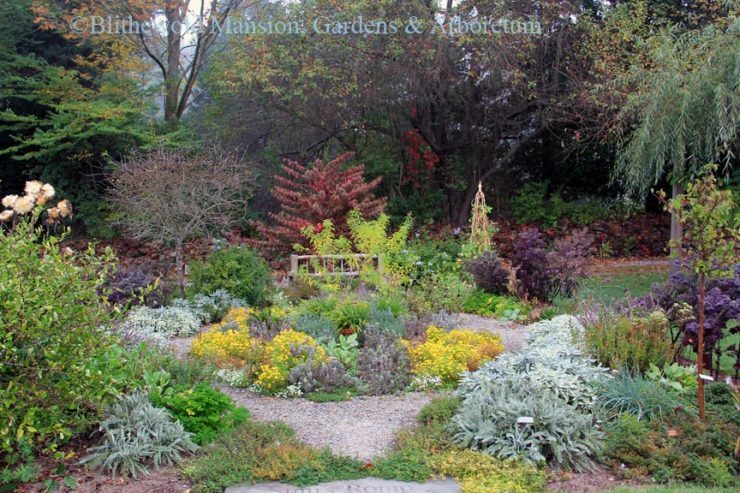 Speaking of sages, the next picture I have for you is of the sage bed in the Idea Garden. Though most of the sages pictured below are not hardy in our region, we still have a special place for them in our hearts and gardens. At the end of the season (before the frost) we make decisions on which plants to dig up as stock plants for the greenhouse and from which ones we will simply take cuttings to start fresh next year. These sages are so joyful with the constant buzz of pollinator activity that surrounds them, not to mention their gorgeous array of colors. 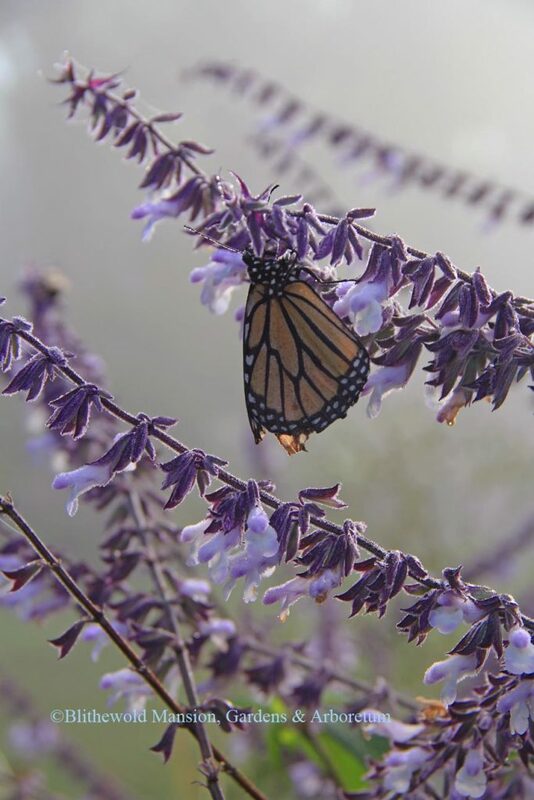 Here is one of the sages in the North Garden with a Monarch butterfly feasting on its nectar on a recent foggy morning. The Monarchs have been numerous this year. We are so excited to see more of them and provide them with a late season food source. 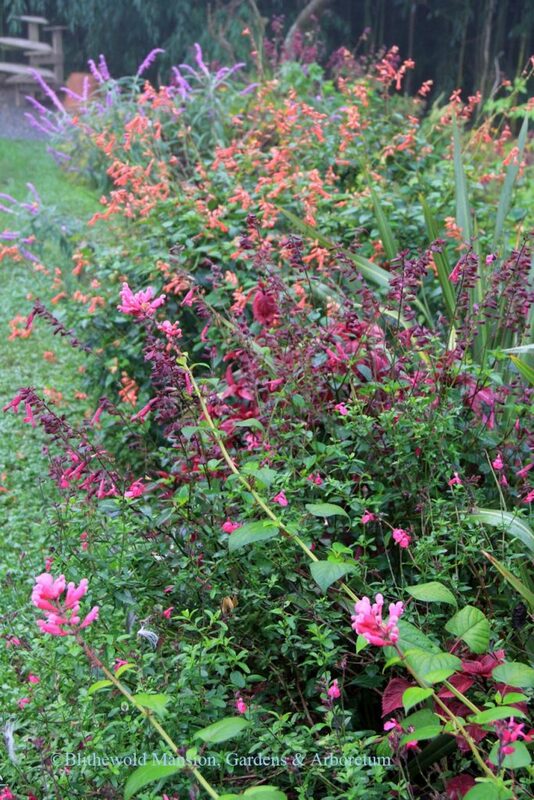 We love our gardens and always strive to have color and interest all season long. It softens the blow of the cooler autumn air and darker days to see beautiful flowers still blooming well into October (and November!). Another tender perennial that is a favorite here is African blue basil. 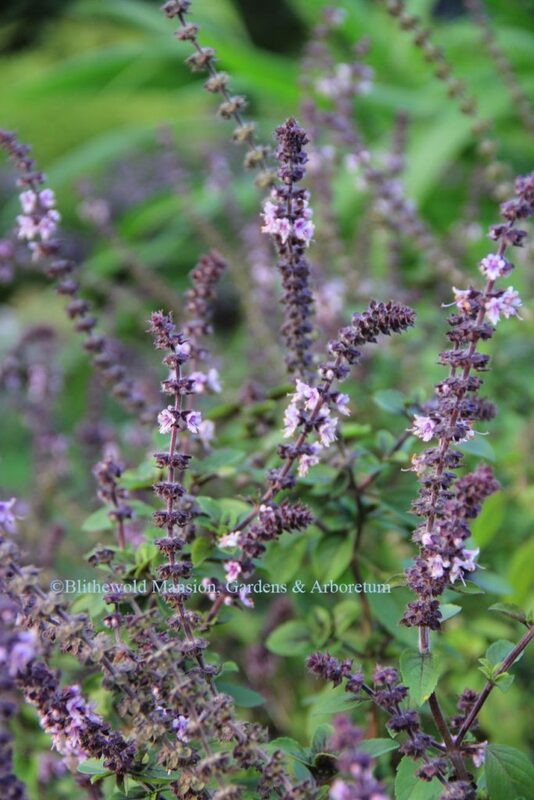 This non-culinary type of basil has stunning dark stems, purple veining in its leaves and long flower stalks that are enjoyed by bees all throughout the summer and fall. Walking by this plant is a festival of sight, sound and scent as the buzz of the bees, beauty of the plants and perfume of the foliage rises to your senses. Before I completely wax poetic on you, I’d like to mention another stunner that wowed us a couple of weeks ago in our new Garden of Hope in the Idea Garden. 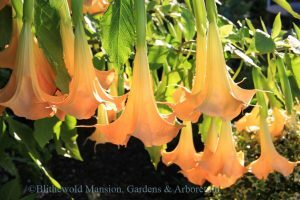 If you follow us on Instagram or Facebook, you may have seen that our Angel Trumpet plants put on a spectacular show this year. We returned from the long weekend in early October to have these beauties greet us in the garden. 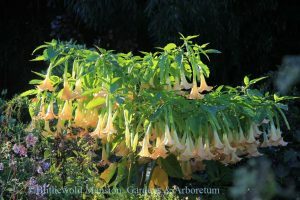 One half of the Angel Trumpet display in the Garden of Hope. Angel Trumpet (Brugmansia ‘Golden Aurea’) up close. These flowers are not only lovely to see but also have a scent that is overpoweringly beautiful. We spent several days puzzling over exactly how to describe the intoxicating fragrance that surrounds these flowers. They are particularly fragrant at night. Though they are not hardy here, we may attempt to overwinter one or two of our plants in the greenhouse. I would be remiss if I mentioned all these flowers and did not also show you the changing foliage here at Blithewold. Whenever I take a walk across the property I find myself captivated by the array of colors on our trees. The sugar maple near the Rose Garden was stunning this year and the Ginkgo leaves are just beginning to be rimmed in yellow. 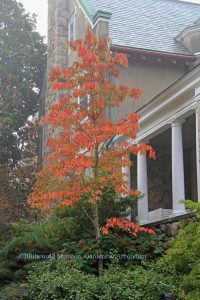 Some of my favorite spaces on the property are usually where the Japanese maples are planted – on the front drive and in the Enclosed Garden near the giant sequoia. But this year I could not take my eyes off of the tupelos. 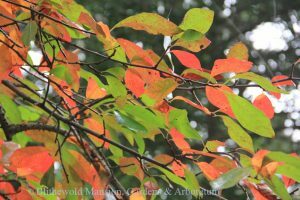 We have three large tupelo trees (Nyssa sylvatica) and they have all been decked out in amazing fall color. As I stood beneath one of them on a breezy day I could have sworn the upper leaves were sparkling. The tupelo is Gail’s favorite tree here. I completely understand why. Next time you see a tree that captures your attention, take a moment to sit beneath it and enjoy basking in its presence. I hope I have lifted your spirits on this dreary day. Or maybe by the time you’re reading this the sun will have reappeared! Either way, I hope you have the chance to enjoy the season. Each day has its own beauty. Come walk around Blithewold if you need a reminder of how lovely the world can be. *Grounds are open daily from 10 am to 5 pm. The house is currently closed, but will reopen for Christmas at Blithewold on November 24th.